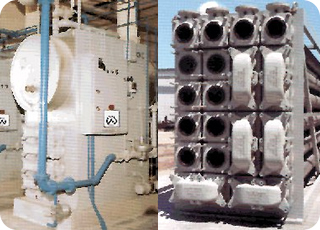 HeatX external heat exchangers are available in either an exchanger-only design or exchanger-boiler combination units, which are fully shop assembled and tested with all necessary boiler components, including gas, water and electrical controls. Exchangers are concentric tube counterflow type, which have been proven to be the most efficient design available. Boilers on combination units utilize forced draft burners for efficiency and easy burner control. Boilers can utilize sewage gas and any auxiliary fuel with controls automated for automatic fuel switchover for maximum sewage gas utilization. HeatX units comply with the requirements of ASME, are National Board inspected and stamped, and range from 110,000 to 3,000,000 BTU per hour. Almost any Temperature Phased Anaerobic Digestion (TPAD) system offers an opportunity to include a sludge-to-sludge heat exchanger. The process involves heating sludge to more than 130°F for retention in a thermophilic digester, then cooling the sludge for retention in a conventional mesophilic (less than 120°F) digester. 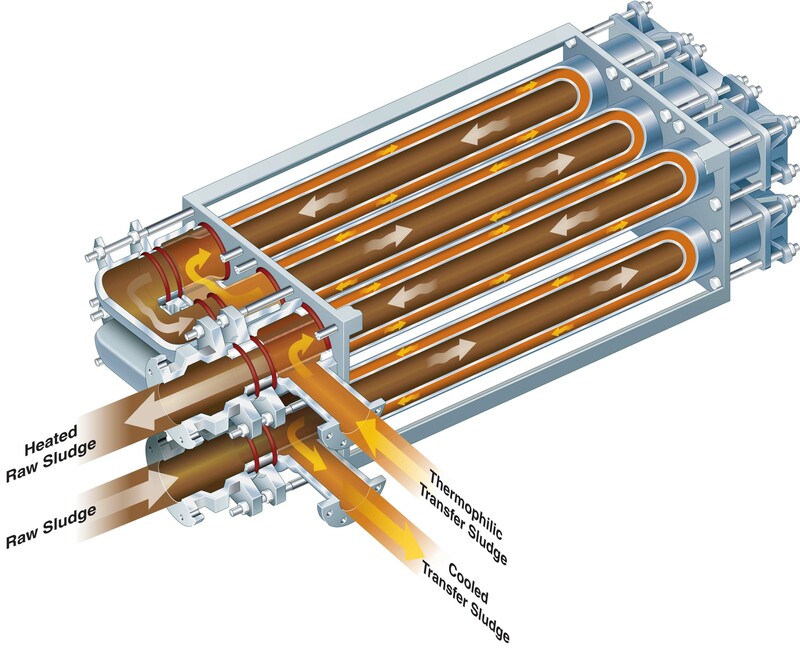 A sludge-to-sludge heat exchanger is used to remove heat from the thermophilic transfer sludge before it goes to the mesophilic digester. The recovered heat is then used to preheat raw sludge prior to a pass through a water-to-sludge heat exchanger for the thermophilic digester.